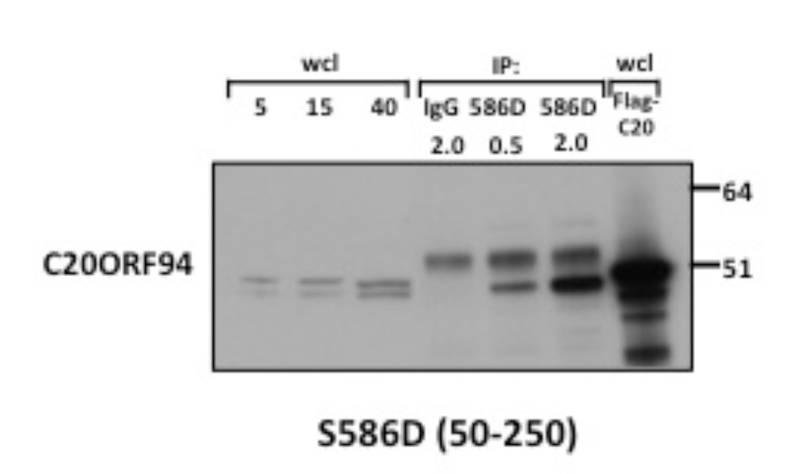 C20ORF94 / SLX4IP was immunoprecipitated from HEK293 human cells (2 mg/IP) using the 2nd bleed antibody of anti-SLX41P S586D (0.5 or 2 ug). As a negative control, pre-immune IgG was used. Anti-SLX41P S586D 2nd bleed was used for immunoblotting for 1 hour at 1 ug/ml or 0.2 ug/ml overnight in 5 % milk TBS-tween. 5, 15 and 40 ug were loaded in the same gel, S586D does seem to recognize a doublet, the lower band corresponding to SLX41P in lysates.